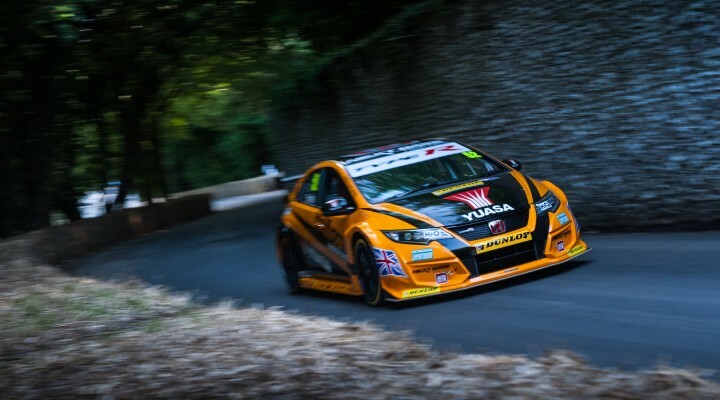 No fewer than nine BTCC drivers are taking on the Goodwood Hill at this weekend’s (24-26 June) famous Festival of Speed, with the tin-top shootout getting underway earlier today. Honda, MG, Subaru, BMW, Ford, Chevrolet and Mercedes BTCC cars are all represented and it was WSR’s Sam Tordoff earning bragging rights on the morning run – the Yorkshireman’s BMW 125i M Sport was fastest of the 2016 BTCC crop and seventh overall from nearly 50 competitors. Tordoff, Ash Sutton, Josh Cook, Jason Plato, Matt Neal, Gordon Shedden, Andrew Jordan, Kelvin Fletcher and Adam Morgan will all get timed opportunities over the weekend with Sunday being the main event, but not all of them are in competitive mood. Jordan eventually topped the times on Friday as he edged out Tordoff by just three tenths of a second. The 2013 BTCC champion starred in his Pirtek Racing Ford Focus, but also wowed the crowds in a World Rallycross car later in the day. You can keep up with live timing and results of the event at http://www.tsl-timing.com/event/162522 and the official BTCC website will feature a review early next week.